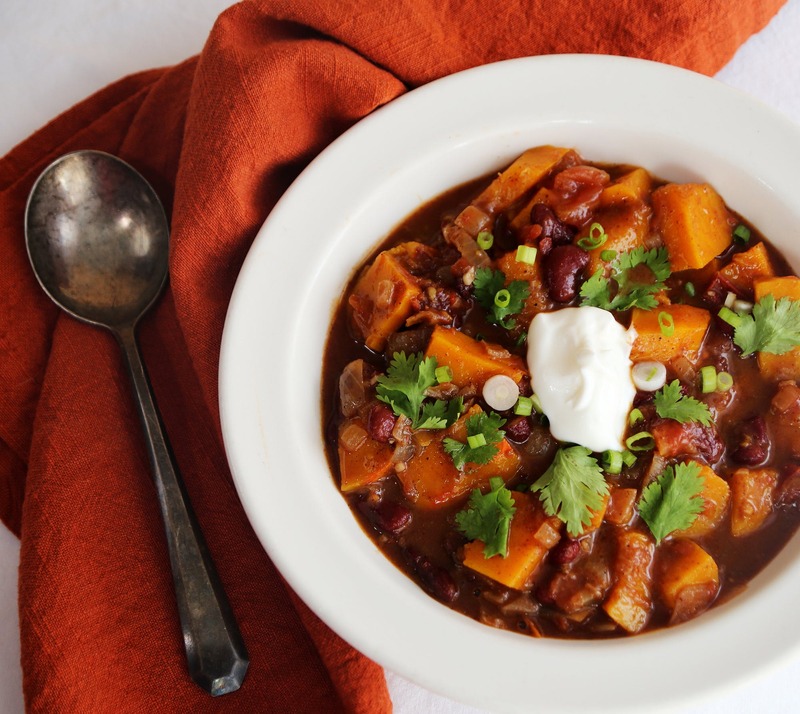 So why not buck the trend with a genuinely delicious Pumpkin Spice and Kidney Bean Chili? It’s not so crazy. Take away the mountains of sugar in most pumpkin-spice foods, and you have a spice combo that can take a turn to the savory, even spicy, side of things. Let’s step back from the pumpkin-spice phenomenon and take a look at the spices within it. As far as I can tell, the popular combo is made up of cinnamon, allspice, cloves and perhaps some nutmeg. These spices are known as “warming” spices, because each of them acts to make you feel a little warmer, starting with the tingle on your tongue. They cause the skin to flush and the metabolism to speed up a little. Chiles are also warming, so they fit right in with this dish. That feeling of warmth and comfort is just what we crave this time of year. This recipe does involve peeling and cubing a squash. If that seems daunting, try this method. First, use a large chef’s knife to halve the squash, from the stem to the blossom end. Scoop out the seeds and pulp and discard them. Cut the squash into vertical wedges, about an inch wide. Place each wedge, cut side down, on the cutting board. Using the chef’s knife, cut straight down, in small sections along the peel, until all the peel is removed. When all the squash is peeled, cut in cubes.